Ladies and gentleman, please stow your hipster outrage hats in the seat in front of you, or the overhead compartment. Oxygen masks won’t drop from the ceiling if you hyperventilate from rage after reading a blog post about a coffee shop or anything else that you’re not supposed to like. I was at a Sydney Starbucks with Clara, chilling like a gentleman. When I logged into the Wi-Fi, I noticed Chermside just below the link for Chatswood. My sister and I grew up in Brisbane, Australia for 18 months or so before our family moved to Singapore in the mid-1990s. Chermside was our closest decent-sized shopping centre, which also happened to be where our dentist and GP were. It felt weird seeing Chermside there in 2018. 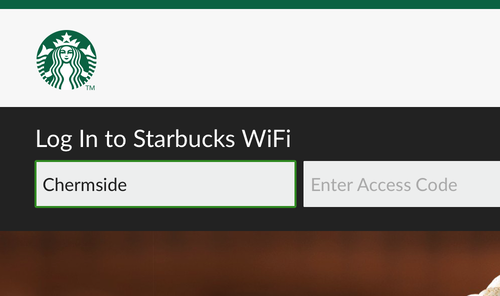 In my head, Brisbane is locked in time in 1996, where Wi-Fi doesn’t exist, and Starbucks wasn’t yet in Australia. It’s such a self-centred view of the world, but it still felt weird seeing it listed there! How is it there? Have I time travelled? I wonder if it’s a similar phenomena to assuming everything in the olden days was black and sepia, on account of seeing photographs from the time period?